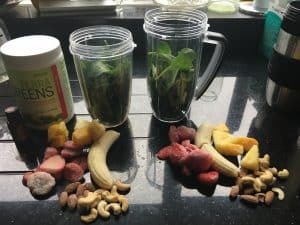 I’ve had a Nutribullet for just over 3 years now, and I have to say that I am hooked. 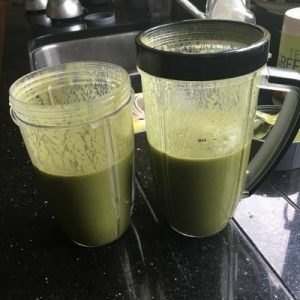 I love my breakfast smoothies, I love whipping up salad dressings, pasta sauces, soups and dips using up all the leftovers in my fridge, and I feel much healthier getting such a mixed variety of fruit and veg every day. I love my Nutribullet, even though it is the basic model, and it hasn’t aged at all even after 3 years of very regular use. And yet when I see the larger Pro models in the shops – I can’t help but wonder – is that one so much better than the one I have? Would it be worth upgrading? 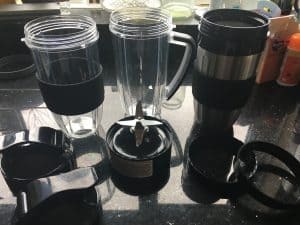 So when the lovely folks at JD Williams offered me a Nutribullet to review, I asked if they could send me the 1200 model so I could review them side by side, and finally know if the upgrade would be worth it. 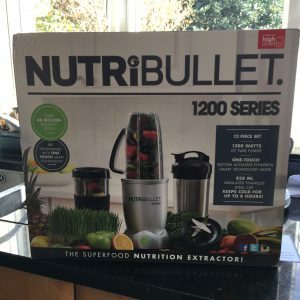 The new Nutribullet arrived very promptly, less than 48 hours after it was ordered. The courier was very friendly and the packaging was excellent. One thing which attracted me to the larger Nutribullet is the cups, They seem larger and more solid somehow. They also have flip top lids which will be great for me when I take my smoothie out and about with me. The blade (pictured on the right compared to the original Nutribullet blade on the left) sticks up further and somehow looks more powerful. It’s also much more easy to clean. I find it interesting to notice that it’s not actually that sharp – you won’t cut your finger on it. The speed of rotation does the work. The only difference in functionality that I can see between the two models is that the 1200 spins twice as fast as the 600 (although the tests will show whether that makes a difference) and the 1200 also has an automatic function where it spins until it thinks it is ready and then stops. I used this function in my testing, spinning the smoothie in the 600 for exactly the same time as the 1200 thought was correct. I put the same smoothie mix in each cup and blasted both of them simultaneously, running the 600 for the exact same time as the 1200 (admittedly this was a bit longer than I normally blend for). The result? Two smoothies which were just about identical, very little to choose between the two. Lesson learned for me – if I do go back to the 600 I need to blast for a bit longer than I have been. 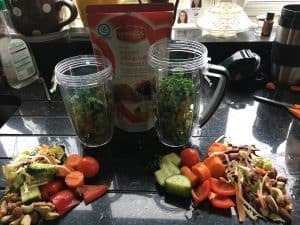 My husband asked me to make him a vegetable heavy smoothie for his lunch, so I chose some veggies that are a bit more fibrous and cut them into quite big lumps to see how the machines coped. 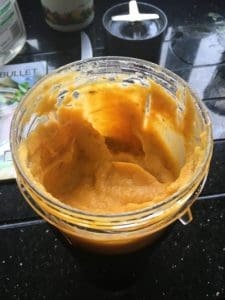 This recipe was just using up the leftovers I happened to find in my fridge – I wouldn’t necessarily recommend this as a taste to try….. Results – the 1200 span so fast that the contents inside actually warmed slightly, so I added a few ice cubes before serving. 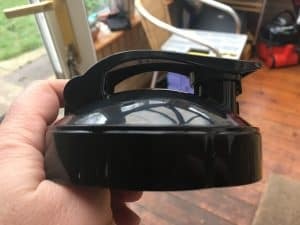 I could detect a slight difference in smoothness – the 1200 was a bit better than the 600, but it wasn’t hugely noticeable – again I had blasted the 600 for a lot longer than I normally do. My husband loved it though! This is the only one that wasn’t a comparative test. I had a half butternut squash that had been roasted in the oven. I chopped it up with the skin on, added Tahini and Ras el Hanout , put it into the 1200 and whizzed it on automatic. The result, perfectly smooth butternut soup mixture, ready in seconds and no sign whatever of the skin. This will be my lunch tomorrow. This is one of my favourite things to do with the Nutribullet. 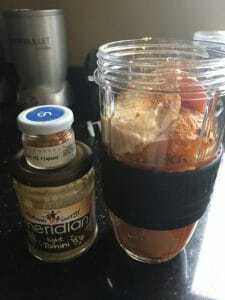 I’m very fond of hummus, and doing it yourself means you can mix up the flavours a bit and make it to your own taste. For that reason I have put no quantities on the recipe – you have to experiment and see what you like best. Once agan, both blenders made short work of this. The automatic function on the 1200 actually went a bit too far for my taste and the hummus ended up a bit too smooth (I prefer a little bit of texture) but it’s tasty and fluffy and just enough lemon and garlic for me! Yummy! This is where I thought the machines would be put to the test and I was right. The test didn’t exactly go to plan. 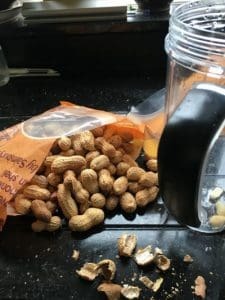 The recipe I used is fairly straightforward – peanuts, olive oil and a pinch of salt. i added a small amount of cocoa powder to jazz it up a bit. So I shelled a big bag of oven roasted monkey nuts and shared them between the two containers. 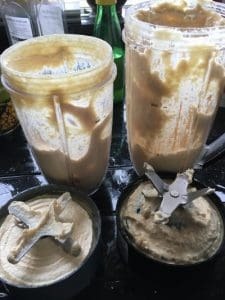 Usually when I make peanut butter you have to whizz it, then scrape it off the sides then whizz and scrape again several times, so I decided to do them one at a time. Then the 1200 – I did the same and it was even less smooth than the 600, so I added a bit of oil. I went back to the 600 and whizzed again, no noticeable change – the mixture went out to the sides almost instantly. 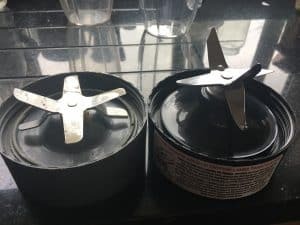 So then I decided to put both mixtures together into the 1200 to see if the extra bulk would help it to blend – again it flew to the sides almost instantly and did not blend at all. Finally I put both mixtures back in the 600. 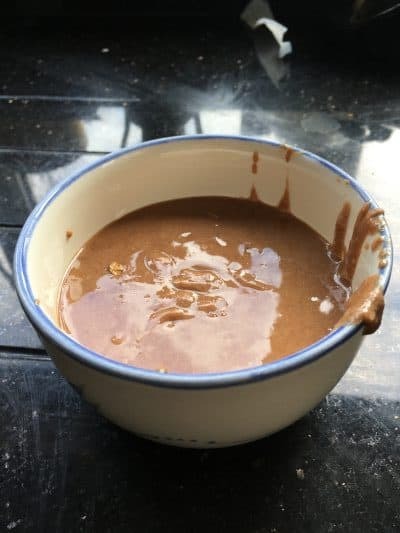 This time they blended beautifully and formed a nice smooth paste, however because of the extra oil that I had added the paste was a bit too runny and I didn’t have any more nuts to thicken it up. Result – I made chocolate peanut butter, although it wasn’t great and the 600 was the clear winner in this case. Lesson learned – if I do this again – I need larger quantities of mixture….. 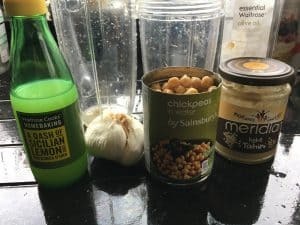 So after 1 day of testing out the Nutribullet 1200 with some of my favourite recipes, I can honestly say that I’m not as impressed as I thought I would be. In fact, for most of the recipes I tried, the 600 was every bit as good if not better. Where I have had problems with the 600 before, I learned that I just need to run it for a bit longer. The cups and glasses that come with the 1200 are lovely and I really love the flip top lid. The automatic finishing function will come in handy too for smoothies – I can set it running and get on with something else. But I need to remember not to use it if I prefer a bit of texture. 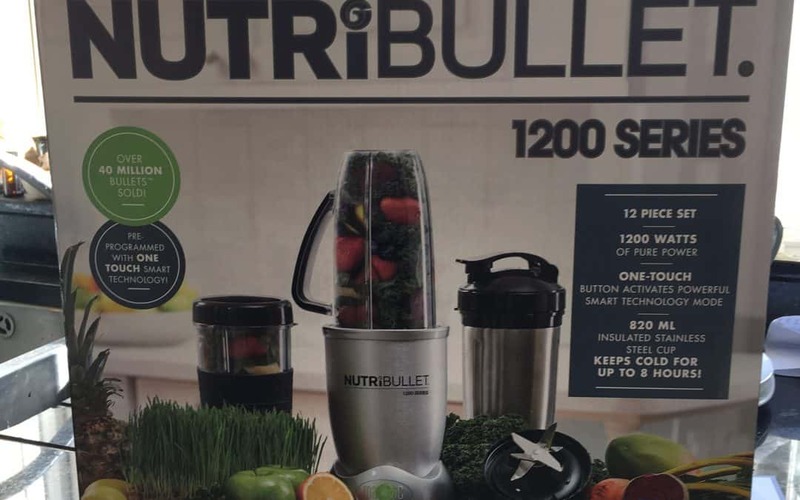 If I was buying a Nutribullet from scratch now, I might still be tempted to buy the 1200 because of the glasses and kit, and the automatic button. But honestly, I’m very glad I didn’t shell out for an upgrade because I don’t think it is really providing extra value. 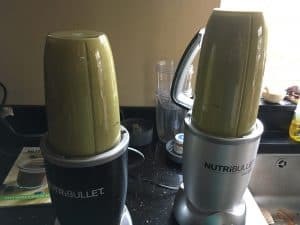 If this opinion changes after I have used the machine for a while I will come back and alter this post, but for the moment I would say that if you already have a Nutribullet of any kind you should stick with it and not bother to upgrade. If you don’t have a Nutribullet yet, then go and get yourself one from JD Williams. 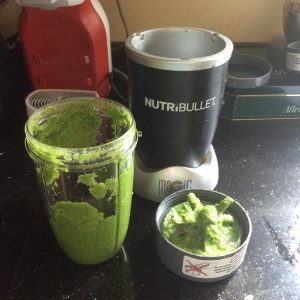 I love my Nutribullet and won’t look to upgrade – Thanks for the report. Thanks for your comment Lyn – several months later I’m almost thinking of going back to the basic one!